Lamb koftas are one of my favourite starters if I go to an Indian restaurant. Minced lamb is a meat that soaks all the flavours really well, and served with a nice cucumber raitha they are so tasty. They are really simple and perfect for many an occasion - buffets, barbeques as well as part of an Indian meal. 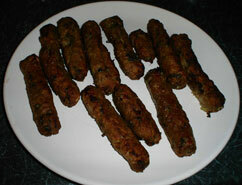 Kofta is probably derived from Persian/Arabic meaning 'to beat' or grind. Certainly derivations of the word are common all over the middle east and into parts of eastern Europe. The original koftas were made into balls rather than the typical sausage shape we usually see today, and often contained hard boiled eggs these are nargisi kofta, rather like the British Scotch egg (which was probably inspired by these anyway) Koftas can also be made of a vast variety of other things such as prawns, beef, chicken and are sometimes 'padded out' with bulgar wheat or rice or vegetables. Coriander leaves. You can use mint instead if you wish. 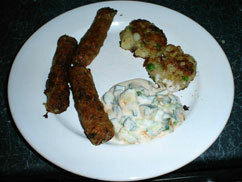 Lamb koftas really are pretty simple. You can cook them on a barbeque on skewers if you wish, soak wooden skewers in water before using. As you are rolling them out a little flour is a good idea. This stops them sticking to your hands and surfaces too much and also acts as a bit of a binding agent. Some recipes suggest brushing with a little oil before grilling I don't usually bother but it does make the outsite a bit crispier and so the koftas don't fall apart so easily. In Indian restaurants lamb koftas are often served as a starter with cucumber raitha and this does seem like a good idea. You can also serve them as part of a main meal with any type of Indian bread or some potato dish such as aloo chaat or aloo tikki.